Get here NDA GAT Answer Key 2019 Set A of exam held on 21 Apr 2019. Candidates who got Set A question paper in General Ability Test of UPSC NDA/NA 1 2019 can check its answer key from this page below and download PDF. This NDA answer key contains correct answers of 150 questions asked in GAT Set A Question Paper. You can estimate marks out of 600 by using the NDA General Ability Test Set A Answer Key before declaration of result of NDA 2019. NDA GAT Answer Key 2019 Set A can be checked given below after exam. Latest: Answer key of NDA 2019 GAT Set A, Question Paper, Expected Cut Off, Student Reactions, Analysis are now available. UPSC releases official NDA answer keys a long time after exam. Therefore the answer key of NDA 1 2019 General Ability Test Set A that you get here just after exam is unofficial. However, we put all our efforts in ensuring that you get here correct answers of NDA GAT Set A Question Paper. Now that exam has gotten over at 4:30 PM, you can enter correct answers in the real time answer key of NDA 1 2019 GAT Set A below. PDF version of the NDA 1 2019 GAT Question Paper of Set A is now available here after exam. AglaSem Is Live Today for NDA Answer Key (including GAT Set A), Expected Cut Off, Student Reactions! 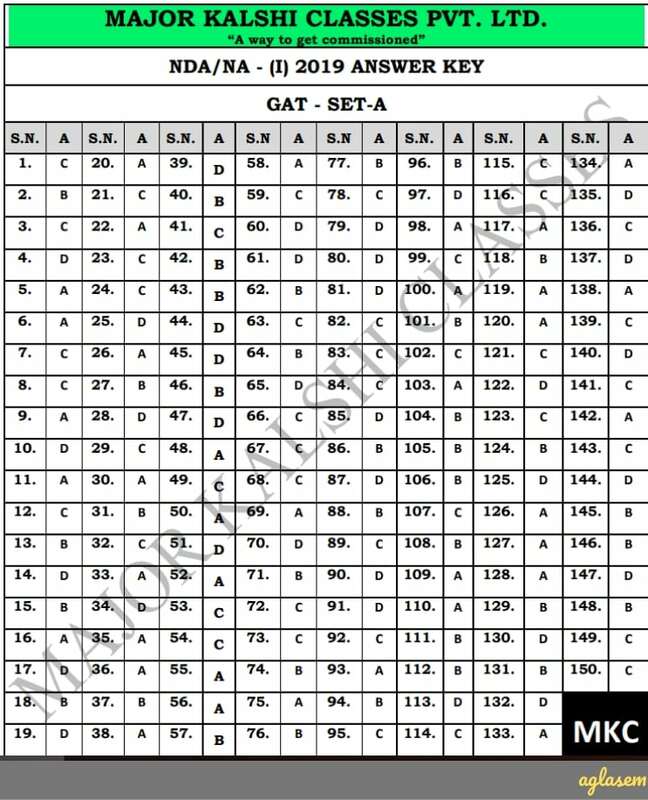 PDF version of the NDA 1 2019 GAT Answer Key of Set A will be available here a few hours after exam. How to calculate marks using NDA GAT Answer Key 2019 Set A? Therefore, marks as per answer key of NDA 1 2019 GAT Set A = 4*Correct answers – 4/3 * Incorrect answers. The only tension of NDA aspirants after the exam is How they performed in the exam. They can get the exact idea of their performance through NDA Answer Key 2019. At first, many coaching institutes compiles the answer key with the help of question paper. Whereas the UPSC release the answer key and respective question paper after the declaration of result. Aspirants preparing for the upcoming examination, for them it is beneficial. The answer key helps the current aspirants by removing their doubts about their performance in the exam. Often called as NDA NA, is the abbreviation of National Defense Acadamy, and Naval Academy. This is the place where cadets of all three armed forces are trained under one roof. They are given the training of mental, moral and physical attributes, to cope with the future battle filed. This is the three-year course and at the end of the course. The only way to join NDA is to appear in the UPSC NDA NA examination which is conducted each year twice by Union Public Service Commission (UPSC). Only unmarried male candidates within the age bracket of 16.5 to 19.5 year can appear in the exam. Let us know your feedback on NDA GAT Answer Key 2019 Set A in comments below. To discuss any question of NDA 1 2019 GAT Set A also you can comment below.